TAIPEI, Nov 22, 2012 (AFP) – Taiwan has decided to bar the Dalai Lama from entering the island, triggering an angry response from a women’s organisation that had invited him to a meeting there next month, officials said Thursday. 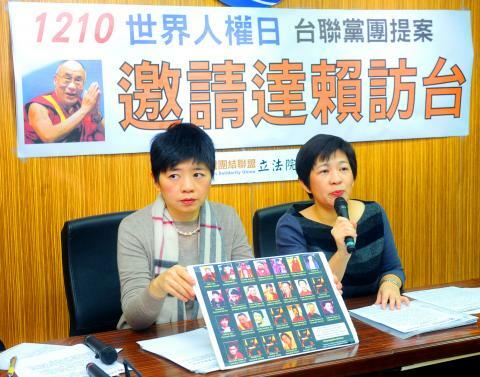 The Taiwan chapter of the Federation of Business and Professional Women, headed by former vice president Annette Lu, said the move reflected fear of angering China, which sees the exiled Tibetan spiritual leader as a separatist. “We are angry as the government is obviously worried about China’s reaction. It’s ridiculous that Taiwan has to listen to China and seek its approval before doing anything,” said a spokeswoman for Lu. The federation said that they had contacted the Dalai Lama directly and that he had agreed to attend their Asia Pacific regional conference in Taipei in December. Taiwan’s foreign ministry confirmed that they would not allow the visit, but denied China had anything to do with the decision. “It’s just not a good time,” foreign ministry spokesman Steve Hsia told AFP, declining to elaborate. China is highly critical of the Dalai Lama, suspecting him of seeking independence for his Himalayan homeland, even though he says he only wants greater autonomy and religious freedom. 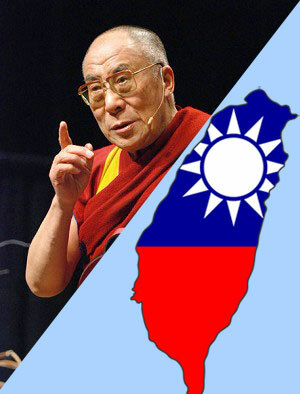 The Dalai Lama had voiced a wish to visit Taiwan in 2008, but at that time, too, the island’s government had argued the time was not right. He did visit Taiwan in 2009 to comfort victims of a deadly typhoon in a trip that was strongly criticised by China and reportedly triggered mass cancellations of mainland tourist groups to the island. Dalai Lama visits to Taiwan are particularly galling for China, as it still regards the island as part of its territory awaiting reunification, even though it has ruled itself since the end of a civil war in 1949. Ties between Taiwan and China have improved markedly since Ma Ying-Jeou became Taiwan’s president in 2008 on a Beijing-friendly platform. The Tibetan people and culture has long been a place of great interest and fascination to the world. When Tibetans had to flee their country in the 1950s, this was a big shock to many all around the globe. For the next few decades, nations everywhere looked upon the exiled Tibetans with great empathy and had hope that they would eventually return to their homeland. 1. You were formerly known as the Tibetan Government-in-Exile. In recent years, you were made to change your name to the Central Tibetan Administration (the CTA) which itself is a large blow to your cause, purpose and stance. Now, you are simply known around the world as the CTA – no longer a government, but just a small administrative body which manages the Tibetan exiled community within the host country of independent India. This is a massive set-back to your movement for Tibet’s autonomy. It shows clearly that Taiwan is on China’s side, as most countries are. Almost every powerful nation in the world is now supporting China (whatever their right or wrong reasons may be). 3. Last year, when the Dalai Lama visited America, his meeting with the American President Barack Obama was considered an unofficial one and he was made to exit through the back door of the White House. Considering the fact that the Dalai Lama is not only so highly respected in the world but is also quite elderly now, this act reflects blatant disrespect and is evidence of the low regard that Americans have for Tibetans. This also shows clearly that although the American government declares that it is a strong supporter of human rights and democracy, they are still afraid of the might of China. If they were not afraid of China, the Americans would have announced the Dalai Lama’s visit as an official one; they would have received and showed him out through the front door. It seems clear that the Tibetans are garnering less and less support around the world. At the same time, Tibetans are becoming more scattered around the world as many are starting to leave the India / Nepal area and migrating to other countries in the West. Tibetan youths continue to fight for Tibetan automony… but what’s the point if their leaders are not unifying their own people? At this crucial time, we urge the CTA to focus on achieving much stronger unity among your own people, especially within the Tibetan communities in India and Nepal. This includes Tibetans from all areas, regions and all backgrounds. It includes Tibetans of different ages, political and religious backgrounds. It includes even Dorje Shugden practitioners, who have received so much discrimination and segregation from their own exiled Tibetan community. This unification of the Tibetan diaspora is especially important at this time. Your portals to the halls of power are narrowing, and there is less and less support in the world now for your cause of autonomy. No matter how much support you think you have for the Dalai Lama, the plain facts show that all civilized, progressive and powerful countries do not openly support a Tibet separate from China. Even something as horrific as the recent self-immolations brought hardly any result and did not move any of these nations enough to do something in support of the cause for Tibet’s freedom. This is a clear indication of the waning support that the CTA is getting. You must also realize that the most powerful Tibetans in the world today are actually Dorje Shugden practitioners. H.E. 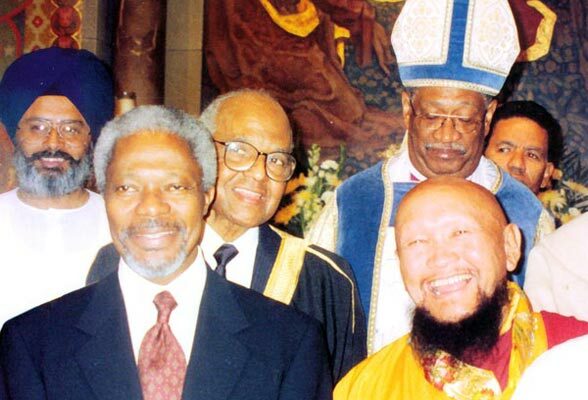 Gangchen Rinpoche is very closely connected to the United Nations. Geshe Kelsang Gyatso of the New Kadampa Tradition has over a thousand centers around the world and resides in one of the most powerful countries, the UK. H.E. Serkong Tritul Rinpoche also has many centers in prominent, highly respected countries such as Taiwan, Australia, New Zealand and Singapore. It would be wise for the CTA to forge strong and sincere friendships with these Lamas. They have gained the respect of the modern world and would be your strongest hope for getting more people to listen to your cause. No matter how respected the Dalai Lama is in the world, that his government, the CTA, are getting less and less support. It would behoove the CTA to start building their community and to stop alienating their own people due to unjust bias and prejudice against religious worship. If you would let small differences in religious practices (such as the Dorje Shugden issue) split your people, then why should the rest of the world take you seriously for a much larger issue like gaining autonomy for Tibet? If the CTA cannot even handle a small exile community peaceably, then how will they handle an entire country? The CTA must realize that getting Tibet back as an independent country or achieving autonomy is besides the point. This is a secondary issue. Before you can even talk about reunification and returning to Tibet, it is so much more important to unify your own people first. "No matter how respected the Dalai Lama is in the world, that his government, the CTA, are getting less and less support. It would behoove the CTA to start building their community and to stop alienating their own people due to unjust bias and prejudice against religious worship. If you would let small differences in religious practices (such as the Dorje Shugden issue) split your people, then why should the rest of the world take you seriously for a much larger issue like gaining autonomy for Tibet? If the CTA cannot even handle a small exile community peaceably, then how will they handle an entire country? That is a very important point to note that has been raised by Admin. The Tibetan Cause is fast losing traction and yet I do not see much being done by the CTA other than persecuting its own people on religious grounds, when it should be unifying its own people and tapping into a bigger sphere of resources. In the recent past, we have seen the players on the global stage shying away from HHDL and the Tibetan Cause. Russia, who could have been one world power that might taken up HHDL's case and broker a deal with China who is their natural ally, denied HHDL entry not so long ago. The underlying reason was that HHDL is seen more, if not as much, as a political figure than a spiritual one. Despite many opportunities, the CTA has failed miserably to stand on its own feet and instead, have depended on HHDL as its sole champion. In the end, its is the CTA's incompetence that is curbing HHDL's work and influence. Australia's PM recently refused to meet HHDL during His Holiness's visit to Australia. Same reason. Even President Obama refused to meet HHDL until recently and even then HHDL was literally shown the back door. The picture pains me greatly. And now Taiwan, who of all nations must surely sympathize with Tibet having tasted (and capably stood up to) China's opposition, has also rejected HHDL's visit. Again, this is a complete failure of the CTA to develop and harness goodwill in the world that have been built up. Is it all too late? The CTA's persecution of its own people reflects its attitude of close-mindedness and moral dishonesty. How can you put your own people down and expect the world to believe that you are indeed sincere and capable of running your own country. People say it is China's economic dominance that has put fear into nations getting close to HHDL and Tibet but China's prominence in international trade is only a recent phenomena. What happened in the decades prior to China's meteoric rise? CTA needs to seriously transform out of its feudal mind and get with the times. If it wants freedom, it must first demonstrate that it does understand the value of freedom. Start by reversing an unjust and unholy ban on Dorje Shugden's practice. The ex-vice president, Annette Lu said she had met with Legislative Speaker Wang Jin-pyng in July and written a letter to Ma in August asking for their assistance in obtaining the visa for what was basically a non-political event. On September 1, Ma told her the issue was “complicated” and it was difficult for him to discuss it with her at that time. Two letters to Ma by the organizers’ president, Australia’s Freda Miriklis, remained without a reply until November 16, when MOFA wrote it welcomed the Dalai Lama to visit Taiwan at an appropriate time, but that it had to arrange for another time than the one applied for. This is not the first time however. In December 2008 and March 2009, Ma stunned politicians in both his own ruling rightist Chinese Nationalist Party (Kuomintang), the Taiwan-centric opposition Democratic Progressive Party and innumerable civic and religious groups by refusing to allow the Dalai Lama to enter Taiwan. Ma finally allowed the Dalai Lama to accept the invitation of DPP Kaohsiung City Mayor Chen Chu to console victims of Typhoon Morakot in 2009 only because Ma did not dare to further offend voters by a further display of discourtesy to this world religious leader. It is complicated for Taiwan to be faced with such situation, had it been another religious leader with no political baggage, it would be a different story. Taiwan has respect for His Holiness the Dalai Lama, but not allowing His Holiness is not about disrespecting His Holiness, but rather a show that China is above TGIE. Let's not forget Beijing abruptly withdrew a visit by the deputy governor of China's central bank and plans for welcome-celebrations for six new flight routes between Taiwan and China were also dropped due to the 2009 visit. I am sure President Ma will consider pleasing China more important than showing respect to the TGIE. What I find interesting was that DPP legislative caucus chief whip Ker Chien-ming said that when Ma Ying-jeou was mayor of Taipei City in 2001, Ma told the Dalai Lama that he would always be welcome in the city. Looks like His Holiness is not welcomed anymore. As Tibetans garner less and less support around the world, especially now that His Holiness is moving into the background, I am sure more incidents like this will appear in the headlines for all to see. It is sad, but TGIE should really look into improving the lives of Tibetans in exile so that they remain relevant and competitive, and not backwards and being torn with archaic issue like religious bans. 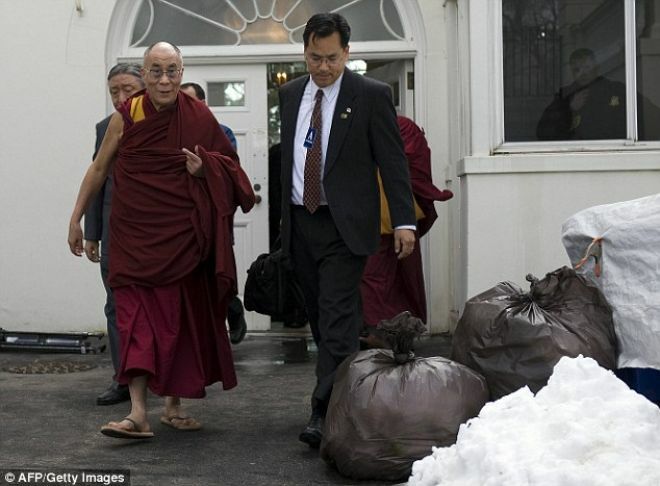 Seeing HHDL was shown out through the back door of the White House, past the garbage dump hurts me. How could a high lama be treated so disrespectfully? Very valid points raised by the Admin. If CTA cannot even handle a small exile community, how could they handle an entire country? It a definitely not a strong and intelligent government would do to create schisms in the country. We all know that if a government is strong and respected by other countries in the world, they would need to unite the people in the country, to have humanity and have growth in economy. So, CTA, wake up! The way to liberation is not by creating schisms. The way to liberation is to create unity! Lift the ban, be united and you will be stronger! 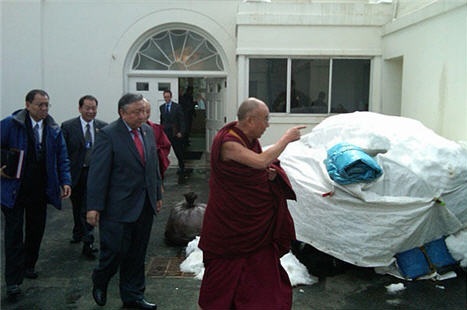 Its so sad to see HHDL to be send off through the back door after meeting the US president. But as you can see, HHDL was not affected by it at all, its just us who are unable to accept what we see and view it as a injustice act towards him. It doesnt surprise me with taiwan rejecting HHDL visits, the taiwan government cant find excuse to approve his visit to taiwan as it contradicts its policy on the straits political stand, Peoples republic of china friendly. On a political viewpoint, taiwan has to bend down to china as it has became and will become one of the world economy giants in the world. 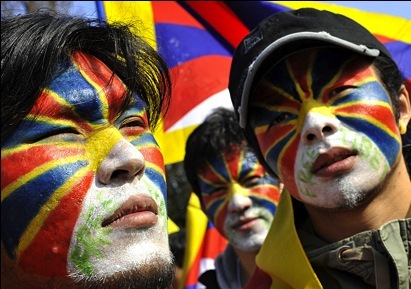 What is increasingly obvious is the growing disunity among the Tibetans. One of the major contributing factors is the rift, created by the Tibetan Government, between the Shugdenpas and the anti -Shugdens. If this is not arrested,the disunity will cause other countries to further disengage with the Tibetan Government. While people can be indignant at this recent rejection of the Dalai Lama by the Taiwan government, i think that we need to look at this case objectively. Taiwan, like any sovereign nation (and most of the countries in the world) would not wish to alienate China because it realises that it is better to have China as a political and economic ally than not. I don't think that there is any other agenda aside from this. If a great (or perceived to be great) country like the US does not stand up for the Dalai Lama (yes they allow him into their country but they don't exactly do anything else do they? ), how can anyone expect a small relatively young country like Taiwan to go against China? Oh my! it is pretty disturbing to see how the Dalai Lama is disrespected by the US and by Taiwan. While Taiwan and US embraces Buddhism as a whole entity, they do not necessarily need to hold the Dalai Lama in high regard. Thus, such disrespect is being shown to the Dalai Lama. Is the CTA that desperate for attention and coverage that they would not think twice about subjecting the Dalai Lama to such indignity? Wake up CTA. The time to lie and to use poor me stories and to keep quiet and incite self immolations have ended, but the time to rely on something that is reliable: Dorje Shugden has come. If they still dont wanna do anything about it, there will be more and more countries that will be against them. Good luck CTA with avoiding and demonizing your only savior. Very soon, you'll be nothing. The Dalai Lama's star is in descent because people are finally realizing how political he is whilst claiming that he is not. We should pray for a Dharma free from politics and control where all Buddhists have the freedom to practise their beliefs without fear and osctracism. I wouldnt blame the Dalai Lama completely on this. He is still very widely respected by many as their personal teachers, but he also has the responsibility of being the figurehead of the Tibetans, who have been accustomed to 350 years of having the Dalai Lama as their secular leader. We have to remember that people at the white house are not Tibetan Buddhists, and their main concern is to protect HHDL from being harmed. Taiwan barring him would be just to satisfy china and also because the majority of Taiwanese are not Tibetan Buddhists but Taoists and Chinese Buddhists so we cannot expect them to roll out the red carpets for the Dalai Lama. I am not surprise by this news. More countries are banning HH. Recently, the UK ministers has been warned not to meet HH. Most of the countries in the world have trade bilateral ties with China and they are afraid to upset them. At the end of the day, who is Tibet and HH compare to their economy and survival of their countries. the Dalai Lama's popularity has reached its apex a few decades ago, and naturally, what goes up must come down. In that aspect, HHDL's popularity is plummeting because too many people have known him by now and he is just another religious person to many people of this generation. His teachings over-saturated today's minds, and also the world's economy now hinges on China and being China's number one enemy and given that nobody wants to get on Dalai Lama's bad side, HHDL will be of less and less importance in the near future....perhaps that is when the ban no longer has any significance? It is sad that almost every country is using the Dalai Lama issue as a political tool for opposition parties to criticize the party in power, especially on the human rights issue. If only these pro-Dalai Lama parties, political or not, knew what was going on with regard to human rights as a result of the ban on Dorje Shugden practice, perhaps they may be a bit more careful who they hitch their band wagon to. The refusal reflects Ma’s kowtowing to China and pro-Beijing stance while sacrificing his previous pledge to uphold human rights, TSU Legislator Huang Wen-ling told a press conference. Ma has ignored several issues, including human rights violations and the plight of political prisoners in China, since taking office in 2008, TSU Legislator Lin Shih-chia said. 2. They would encourage Tibetans in China to stop their violent act of burning themselves which is in fact against Buddhist and China's law. It lessens the chance on any spiritual autonomy/peace talk goals ever happening between China and Tibet. In fact it just creates an opposite reaction where China's grip on Tibet becomes even harder and tighter. The Dalai Lama and his supporters are doomed to fail in their attempt to attain Tibetan independence by stoking self-immolations, Chinese newspaper People's Daily said Tuesday. Instigating self-immolations in China's ethnic Tibetan areas was "among the latest tactics that the Dalai clique has taken in recent years to achieve their political purposes", the article said. Meanwhile, authorities detained a Tibetan monk and his nephew in the Kirti monastery of Aba in southwestern Sichuan province over their roles in the protests. Since fleeing China in 1959, the Dalai Lama and his followers "have masterminded a series of seriously violent incidents, including the March 14 riots in Lhasa in 2008", it said. "All of them are aimed at 'Tibet independence'," the article noted. "Soon after self-immolations occur, the Dalai clique repeatedly demands 'peace talks' to be held between China's central authorities and the self-declared 'Tibetan government-in-exile' for 'solving Tibet-related issues', China's state-run news agency Xinhua said. 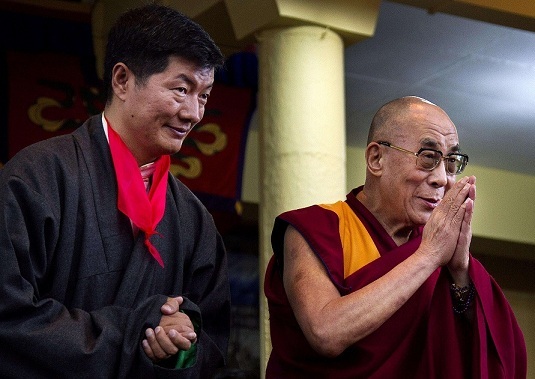 Leaders of the "Tibetan government-in-exile" in Dharamsala in India's Himachal Pradesh have also publicly voiced "hopes" that self-immolations in China's ethnic Tibetan areas will lead to turmoil similar to the 2011 riots in the Arab world, it said. The article in People's Daily followed "some Western media" in pointing out that self-immolations of Tibetans have already became a means for the Dalai Lama and the "Tibetan government-in-exile" to pressure China for political interests. "But China's unity, strength and rising international status will never be shaken by these inhumane acts", it said. "Whatever means they take, the Dalai Lama and his followers can't change the general situation of Tibet's development and stability, nor their doomed chances of splitting Tibet from China," the author said. Both Karmapas have voiced out against self-immolations BUT the Dalai Lama and CTA are still not saying anything. Their silence is approval of the act which actually shows how uncaring they are to their own people due to political agendas. Seems like Dharma, the value of precious human lives are out the window. What will Tibetans represent if even the very thing they are well known for - Buddhism is thrown out the window just because of this life. The Karmapa, one of the most senior religious figures from Tibet, has urged Tibetans in China to end a spate of self-immolations and find other ways to challenge Beijing's policies. Eleven monks, former monks and nuns have set fire to themselves in Sichuan, south-west China this year. Many see the 25-year-old Karmapa as a possible successor to the Dalai Lama as the spiritual leader of exiled Tibetans. Both men have expressed deep sorrow at the deaths and blamed Chinese policies for the self-immolations. 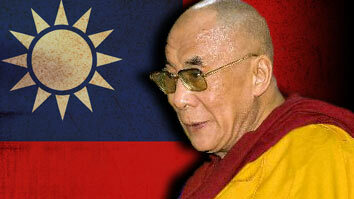 But the elder man also accused China of "cultural genocide" and has not appealed to Tibetans to halt such acts. The Karmapa praised the bravery and "pure motivation" of those involved, saying each case had filled his heart with pain. "These desperate acts … are a cry against the injustice and repression under which they live," he said. But he added: "I request the people of Tibet to preserve their lives and find other, constructive ways to work for the cause of Tibet." "The situation is unbearably difficult, but in difficult situations we need greater courage and determination." Drawing on both his religion and the wider challenges facing Tibetans he added: "Most of those who have died have been very young. They had a long future ahead of them, an opportunity to contribute in ways that they have now foregone. In Buddhist teaching life is precious. To achieve anything worthwhile we need to preserve our lives. We Tibetans are few in number, so every Tibetan life is of value to the cause of Tibet."